Mapplr’s travel guide to Alsace is designed for people who want to spend five days to a week in Strasbourg and the towns along the Route du Vin (Wine Route) in the Alsace region of France. 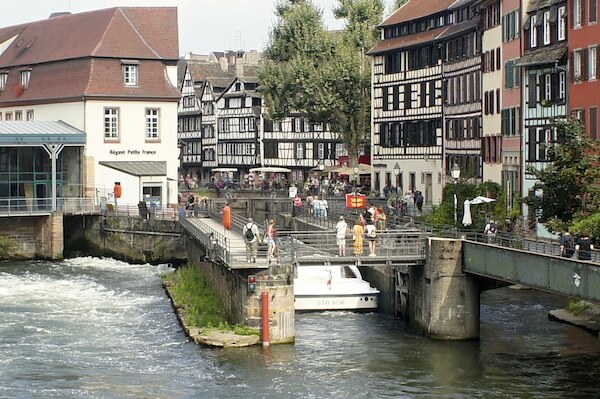 My advice is to give yourself two to three days in Strasbourg to see all of the main sights and to enjoy what the city has to offer, and three to four days in one or more of the little towns along the Route du Vin that stretches south of Strasbourg. I recommend staying in the town of Kaysersberg and using it as your base for exploring the Alsace wine region. Day 1: Arrive in Strasbourg (by TGV from Paris) — rent a car from the car rental office just to the side of the train station (very convenient and efficient) and drive down to Kaysersberg (takes about 1 hour). Check in: Le Chambard Hotel in Kaysersberg. 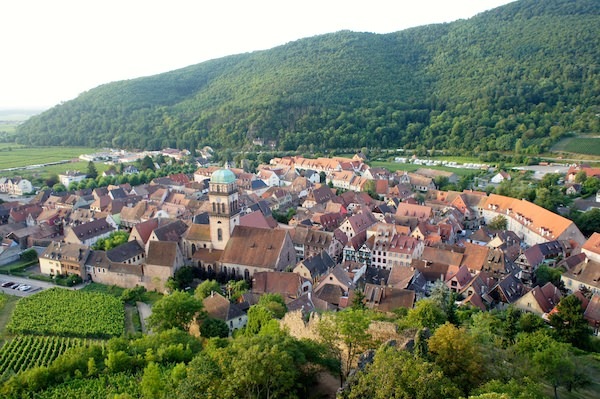 Days 2, 3 and 4: Use Kaysersberg as a base to explore the towns along the Route du Vin, e.g. Colmar, Ribeauville, Riquewihr (early in the morning or very late in the afternoon). Have dinner at least one night at the Michelin-starred Le Chambard restaurant. Day 4 late afternoon: Drive back to Strasbourg, check into Le Cour de Corbeau in Strasbourg, return car at train station. Spend at least two days (I recommend spending two nights in Strasbourg). Day 6: go back to Paris or elsewhere in France. Kaysersberg is a small town filled with beautiful half-timbered houses, set amidst the vineyards, with excellent hotels, restaurants, wine bars and cafes. Indeed, Kaysersberg is roughly in the middle of the Route du Vin, and close enough to Colmar for a short day trip. Overlooking Kaysersberg is a ruined castle fortress which is worth walking up to, if only to shed those extra kilos you’ve gained after eating all that incredible food and drinking the local wine. You can rent bicycles in Kaysersberg to explore the area or walk in the vineyards. What about Riquewihr, you ask? Riquewihr is the most touristy of the small towns along the Route du Vin. It is completely swamped by hundreds of tourists who arrive in massive tourist buses, vans and cars. The reason for its popularity: it is one of the few towns to have been spared from bombing during World War II. As a result, Riquewihr seems frozen in time and looks much like it did in the 16th century, minus the tourist crowds, wine bars, restaurants, hotels and souvenir shops. I visited Riquewihr in the middle of the afternoon and after jostling with the crowds, I simply wanted to get out of there. I’m not saying you should not visit it, just go there at the end of the day, after 17:00 or very early in the morning. Kaysersberg, by contrast, is so much more tranquil than Riquewihr, but it still has lovely old houses, picturesque squares and delightful little wine bars (and a terrific hotel with Michelin-starred restaurant called Le Chambard, which I stayed in and reviewed on Mapplr). Here you will enjoy everything Alsace has to offer without the tourist mobs. Some of you may want to stay in Colmar, which is much larger than Kaysersberg and that’s fine, too because Colmar has a larger selection of restaurants, cafes and shops. 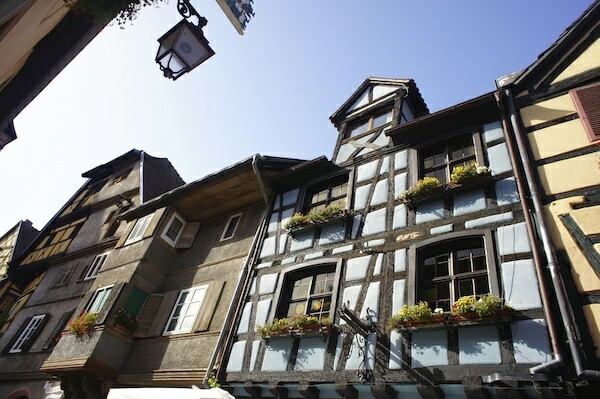 In Colmar, you can stroll down narrow cobble-stoned streets and marvel at the well-preserved churches and houses, many of which date back to the Middle Ages. I recommend that you stay in a restored five-room elegant B&B called Villa Elyane, which I reviewed as well. As I mentioned earlier, I recommend staying in Le Chambard in Kaysersberg. I posted a review of Le Chambard and I recommend that you eat at the Michelin-starred restaurant, which is highly regarded in the region. No visit to Alsace would be complete without a trip to the vineyards and local restaurants serving the wine and cuisine of the region. I recommend having lunch or dinner at Wistub du Sommelier (in Bergheim), an excellent family-run restaurant with an extensive Alsace wine list. Wistub du Sommelier is located in a restored house that dates back to 1748. They have a wonderful shady outdoor garden terrace for dining alfresco when the weather is fine. It’s important to make reservations because Wistub du Sommelier is quite popular among locals and visitors. The Alsace region is filled with small restaurants, hotels and B&Bs that have been in the same families for generations; they provide a unique and memorable experience and I urge you to try them out. Other small towns worth visiting in Alsace are Eguisheim and Turckheim, where you will find many wine bars and vineyards specializing in Riesling, Pinot Noir, Gewürtzraminer and Sylvaner wines. If you visit in October, you can take part in the wine festivals of the region. If you decide to use Colmar as a base, stay at the Villa Eylane, a splended restored family mansion within walking distance from the Colmar TGV Station. It has been turned into an elegant B&B with five rooms. 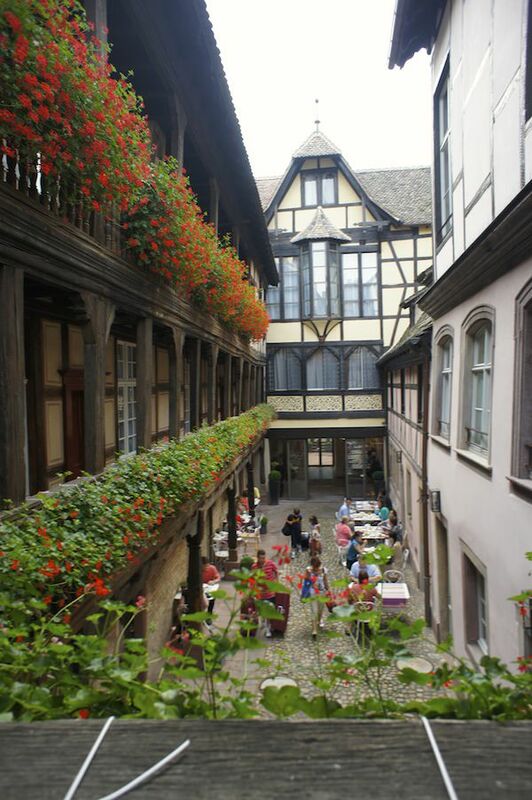 I recommend Le Cour du Corbeau, a restored 16th century inn turned hotel that lies only a few minutes walk from the Strasbourg Cathedral and La Petite France. For fine dining, I recommend Buerehiesel, set in the Parc de l’Orangerie, a lovely quiet, dignified place to have lunch or dinner (note: there is a prix fixe lunch that is reasonably priced). 1741 (22 Quai des Bateliers, Strasbourg, Tel. 03 88 35 50 50): Located across the river from the Palais Rohan in the shadow of the Cathedral, this gastronomic restaurant features modern Alsatian food served in a series of intimate dining rooms. La Cuiller a Pot (18b, rue Finkwiller, Strasbourg, Tel. 03 88 35 56 30): This small charming restaurant in the center of Strasbourg serves local cuisine in an elegant dining room. It is a favorite among locals and has a very reasonably priced menu. A note about restaurant reservations: Use Lafourchette.com to find and reserve restaurants in France. Many restaurants, even those with Michelin stars, will offer lunch or dinner on certain days at a discount on Lafourchette. This is a great way to try the best of French cooking without doing extreme damage to your pocketbook. To find the most highly rated places, narrow your search by clicking on Les Mieux Notés. Lafourchette will present a list of restaurants based upon the diners’ rankings. La Petite France (a UNESCO World Heritage site) is the name of the neighborhood located on the Grande Île (Big Island) where the River Ill gets diverted into a network of canals. Here you will find half-timbered houses, covered footbridges, narrow pedestrian-only streets, locks and water wheels, all very picturesque and historic. Top 10 guide to Alsace Wine Route (published by The Guardian in 2012): vineyards to visit, vineyard B&Bs, and local bistrots.